It was with deep sorrow that I was rudely confronted on 25th April 2018 by the news of the demise of my mentor, Professor Adebayo Adedeji, the quintessential development expert who held sway at the United Nations Economic Commission for Africa (UNECA) from 1975 to 1991. For over four decades, Adedeji was indisputably the leading proponent of regional integration in Africa. He was widely regarded as the intellectual father of African integration, just as Raul Prebisch was of Latin American integration and Jean Monnet the European integration. He persistently stressed that economic co-operation among African states is a sine-qua-nonfor the achievement of national socio-economic goals, and not an “extra” to be given thought to after the process of development is well advanced.He remained a peerless champion for regional integration in Africa, indeed the epitome of the push for integration in Africa. It all happened when in November 1984, the ECA and the Dalhousie University at Halifax, Nova Scotia, Canada, jointly invited me to present a paper on “Development and Regional Integration Since 1980” at a Conference on Africa’s Economic Crisis and the Lagos Plan of Action. I had then come from Harvard University to take up an appointment at the University of Florida, Gainesville, as Professor and African Area Studies Consultant. It was at this conference that Professor Adedeji and I met for the first time. In April 1985, the ECA invited me to Addis Abba for a briefing on an extremely demanding and challenging consultancy service titled, ” A Study on Review and Appraisal of the Impact of the United Nations Economic Commission for Africa on African Development: Policy-making, Programming and Execution of Projects, 1975-1985.” After completing this assignment, which took me to all the five sub-regions of Africa –East, West, Central, North and South — to conduct interviews with development planning ministers and senior technocrats, Adedeji strongly advised me to resign from the University of Florida. I was offered a UN appointment first, as Head of Development Studies Department at the United Nations Institute for Namibia (UNIN) based in Zambia, subsequently Deputy Director and Director of the Institute and, after Namibia’s independence, as Principal Regional Advisor and Coordinator of the United Nations Multidisciplinary Regional Advisory Group (ECA-MRAG) at the Cabinet Office of the ECA.As Executive Secretary of ECA, Adedeji was in charge of the UNIN and therefore involved me in all major and critical African development strategies. My missions to the ECA became particularly frequent when Adedeji set up, and appointed me a member of, an International Advisory Board of 20 eminent African and non-African personalities in July 1988 to advise him to challenge the Bretton Woods (World Bank and IMF) orthodoxies –Structural Adjustment Programmes (SAPs)and provide alternative to the Western push for SAPs. Adedeji worked tirelessly to reverse the advert impact of the SAP on economies and led the development of African Alternative Framework to SAPs for Socio-economic recovery and Transformation (AAF-SAP), which charted a new course for Africa’s development. He gave intellectual great hope in Africa as Deng Tsiao Ping led on the transformation of China. A year after in 1989, I was given a major assignment to lead a high level four-man UN General Assembly special joint UNDP/ECA/UN Headquarters Evaluation Mission to review the “Structure, Organization and Operations” of the Multinational Programing and Operational Centres (MULPOCs) of the ECA. The Review Team visited all MULPOC offices and 12 selected Member States covering all the sub-regions. The Report which I submitted as leader of the Review Team made fundamental recommendations leading to the restructuring of the MULPOCs. Adedeji hailed it as a masterpiece and indeed, a most useful document. My work as Coordinator of ECA-MRAG was given a new dimension with the release of Nelson Mandela from prison on 11 February, 1990 and his appointment as the head of South African Transitional Government. To enable the ECA to effectively implement its mandate in the emerging South Africa, Adedeji instructed that a special Southern Africa Desk and Task Force be created at the Cabinet Office of the Commission with me as head. For almost two years, the Southern Africa Desk and Task Force was in regular touch with the President Mandela’s Transitional Government. This enabled me to have regular interactions with President Mandela. Impressed by the ECA advisory services, President Mandela sent me a personal invitation to his inauguration as South Africa’s first black President in May 1994. As if this was not enough, I was again invited to witness the ceremony of conferment of an honorary doctoral degree on the President by the Stellenbosch University on 25 October 1996. Professor Adedeji highly welcomed my study on ECOWAS, arguably the first academic study of the Community, published in 1986. Indeed, it was Adedeji’s intellectual and physical effort which resulted in the formation of ECOWAS, earning him the title the “Father of ECOWAS”. 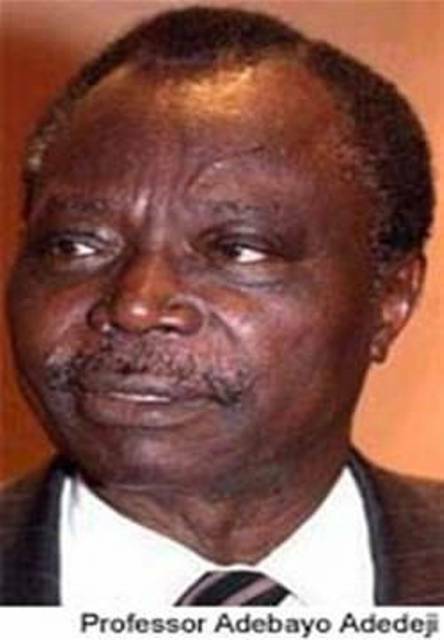 In 1991, Adedeji asked me to join him to serve as United Nations technical advisers to the Eminent Persons Committee Reviewing the ECOWAS Treaty under the chairmanship ofGeneral Yakubu Gowon, former Head of State of the Federal Republic of Nigeria. Adedeji put me in close touch with almost all the Southern African leaders, in particular, President K.K. Kaunda of Zambia, Sam Nujoma of Namibia and the current President of Namibia, Hage Geingob, my predecessor as Director of the United Nations Institute for Namibia. My wife and I had the honour to accompany Professor Adedeji to the Namibian independence celebration on 21 March, 1990. Besides President Mandela, several notable South African leaders such as Thabo Mbeki supported and admired my ECA-MRAG mission in South Africa. In view of my critical involvement in the South African “decolonization” process, Cyril Ramaphosa, the current South African President, fondly referred to me as “leader of Ghanaian Mafia” in South Africa. It was indeed a major memorable occasion when the ECOWAS Commission invited me to accompany its Vice-President, Toga McIntosh, to interview Professor Adedeji at Ijebu-Ode, his home, in June 2013, for the ECOWAS @ 40 Documentary. Much to the surprise of his family members and the television crew, Adedeji,showing visible signs of physical strain, embracedme with tears of joy. He insisted that the mission be extended by two more days to enable him to fully enjoy our reunion. Such is the imperfection of all human happiness; and every period of life is obliged to borrow its enjoyments from time to time. In youth we have nothing past to entertain us, and in age we derive nothing from the retrospect but fruitless sorrow. The loss of our friends and companions impresses hourly upon us the necessity of our own departure. Adebayo Adedeji was indeed an illustrious son who gave his life, energy, passion and intellectual gift to the African continent. Hefought a good fight and has left us a legacy to follow. *Prof. S.K.B. Asante, Ghana’s renowned political economist, regional integration disciple, and former Principal Regional Adviser and Coordinator at the UNECA,now serves as consultant to international organizations, including the United Nations, World Bank, African Development Bank, European Union, ECOWAS and the African Leadership Forum.